What is the best way to get back pain relief? Americans spend at least $50 billion each year on lower back pain, which is the most common cause of job-related disability and a leading contributor to missed work. Only headache is more common than lower back pain; back pain is the second most common neurological ailment in the United States. 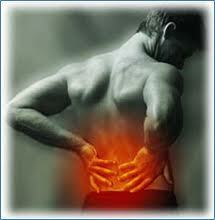 The majority of lower back pain episodes gradually disappear without active treatment within 3-5 days. Over time low back episodes tend to occur with less and less provocation, take longer to resolve, and tend to be gradually more severe as the deterioration of the supporting structures of the lower back continues due to the wear and tear of living. An acute lower back pain episode is a short-term event that usually starts suddenly and lasts from a few days to a few weeks. Most acute back pain is due to mechanical problems with the disc or gliding joints of the lumbar spine called facets; it tends to arise from some type of lifting or twisting trauma to the lower back (work-related, sports, auto accident or gardening) or as a result of an underlying disorder (arthritis). Symptoms can range from minor and occasional muscle ache to deep shooting or stabbing pain, with variable loss of range of motion, as well as inability to stand straight. In the acute stage pain can radiate from one part of the body where it originates to other areas as determined by the nerve distribution of nerves that are irritated at the spine. A chronic lower back pain is a long-term event that usually starts just as suddenly as an acute problem, but persists for more than three months. The causes, characteristics and progression are similar to a acute episode of back pain. What is most important about a chronic low back problem is the progressive nature of symptoms and difficulty to isolate the cause of pain. Large and simple joint made of cartilage – the disc that acts as a shock absorber, space to keep spinal vertebra so they can allow for movement between spinal segments. Small and complex joints made of cartilage – the spinal joint that connect vertebrae and act as a series of hinges that allow and guide movement between spinal vertebrae. Spinal discs made of dense but flexible cartilage with a jelly-like inner cores that allows movement between spinal vertebrae. A small or large, acute or chronic, irritation or mechanical problem with any of these spinal structures can result in lower back pain as well as the possibility of pain that radiates or is referred to other parts of the body. Splinting pain from resultant lower back muscle spasms can be severe; it originates as a mechanism of preventing movement of spinal bones so the lower back can rest to recover and can later become chronic if the muscle tissue becomes infiltrated with fibrous tissue. Lower back pain is extremely common, with 85% of the adult population reporting lost time from work of at least three days by 50 years of age. Severity, range of symptoms and frequency of lower back pain will vary greatly. A massive lower back disc degeneration might cause only temporary and mild discomfort under special circumstances, while a simple lower back muscle strain that starts from a small twist might cause excruciating and constant lower back pain that prompts an emergency room visit. Many cases of lower back pain result in pain and debilitation that is inconsistent with the size of stress or injury that is sustained and general strength and health of the lumbar spine. Young adults (30-60 years) statistically are prone to experience low back pain from any of the five disc spaces that separate lumbar spinal bones (vertebrae). This can occur as a lumbar disc herniation or muscle strain or sprain to most any of the lumbar soft tissue supporting structures. 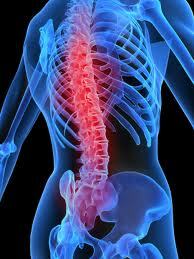 Older adults (over 60 years) are more likely to display lower back pain due to degeneration or weakness of the (e.g. osteoarthritis or spinal stenosis) or from a fracture. Lower back pain diagnosis and treatment can be some of the most challenging in medical practice. For treating many of the common and non-threatening back problems safe and effective natural treatment provides a high percent of success for low back pain relief when the structural spinal problems are considered, found and corrected.